With Tracy on a well deserved vacation this week, I had the opportunity to hit the road for the delivery route. I must say it's a difficult job, getting the truck in some tight spaces (and I wasn't even doing the driving!). But it's also rewarding getting to meet the buyers and producers in person, and seeing how much our customers appreciate the beautiful local food that's available! A special welcome to Maplewood Nursing Home in Westmoreland and Nature's Green Grocer in Peterborough. 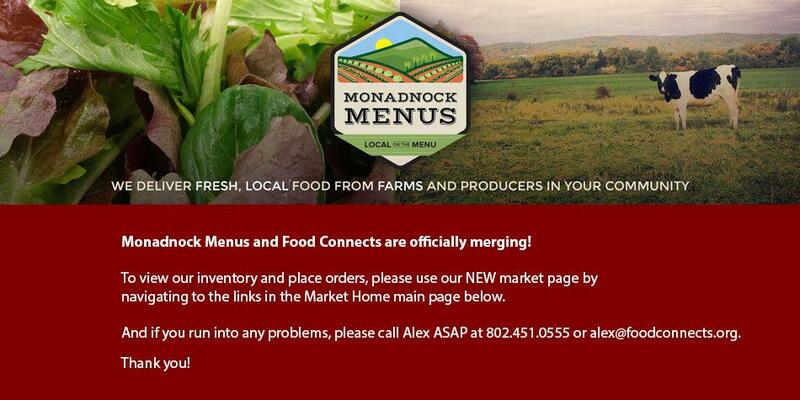 Thanks to you all for being part of Monadnock Menus! Check out all the new items that have been added recently from a wide variety of wonderful, local producers. We have some new additions of: blueberries, carrots, cucumbers, beets, radishes, potatoes, endive, fresh herbs, numerous lettuce and kale varieties and much more. July Harvest of the Month is Berries! Check out VT Harvest of the Month for some great recipes and free educational materials for your cafeteria or shop. Monadnock Berries is a pick your own blueberry, raspberry, gooseberry and currant farm in Troy with a view that will make you want to stay forever. Other crops we grow include strawberries, black raspberries, peaches, plums, nectarines, pears, apples, apricots, tomatoes and cucumbers, and we also own and operate a Garden Center on Rt 12 here in Troy. Monadnock Berries uses Integrated Pest Management practices minimizing the use of chemicals, integrating the use of beneficial insects and natural fertilizers, and acting only on the specific problems that may arise in a season instead of blanket-spraying regardless of pests present. We do not spray our blueberry bushes after blossom set, so you will never find residue on their fruit. This is a light soft yet sturdy burger roll. They have a beautiful egg wash finish, giving you a quality appearance that matches the product. They also freeze unbelievably well!